Of the major Scottish distilleries Glen Grant is probably the one I have least experience of. Indeed, I’ve had more whiskies from Caperdonich (Glen Grant’s sister distillery) than I have from Glen Grant. And of the handful I’ve tried one has been among the worst Scotch whiskies I’ve ever had: a Duncan Taylor NC2 sherry cask bottling which was quite lovely on the nose, and fine on the palate but then turned to cheap cooking sherry on the finish. I had to consign most of that to a home blend–though I did reserve a large sample for reference, which means I may yet review it for the blog. Anyway, Glen Grant has a very good reputation among the cognoscenti, especially much older, sherried iterations from the indies. This one is neither old nor sherried (nor an indie, for that matter) but I do like it. Nose: Bright and acidic fruit: some lime, also crisp pears, tart green apples and gooseberries. Not a whole lot of development for a bit; maybe a greater maltiness under the acid. After much longer the malty note expands and balances nicely with the acidic fruit. Palate: Much sweeter than you might expect from the nose. Apples and pear salad dressed with a touch of cider vinegar. A faint bitterness (apple peels). Gets more limey with time and there’s also a minerally quality–like pebbles in a clean spring or river. Turns maltier on the palate as well as it sits. Finish: Medium but no new development. Comments: Perfect whisky for the summer. Not a whole lot to it but, to quote Spencer Tracy, what there is is choice. After the initial bright acidity of the nose wears off it is remarkably consistent from nose to palate to finish with perfect balance between the acidic fruit and the sweeter, slightly musky maltiness. A good aperitif whisky, and would probably also be quite good with a tangy goat cheese. 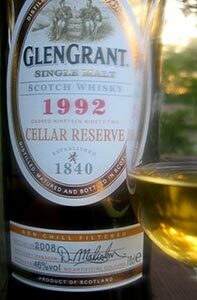 This entry was posted in -Whisky by Rating, 85-89 points, Glen Grant. Bookmark the permalink. Nicely considered and well written. I look forward to reading more of your reviews. I am savoring a couple bottles of Glen Grant from 1990 that were put out by the independent bottler: Singatory Vintage. I’ve found them to be very reliable (unlike Battlehill). The arrival, body and finish of my 1990 is perhaps a bit bigger than what you’re describing her. The finish, in particular, is especially long and the warmth that spreads is pronounced–for me an all weather scotch. Before I spent big $ I wanted to get a sense of the 1992. Drinking this again tonight and as the bottle approaches the end there’s a lot more malt and some nice toasted wood on the nose and also on the palate–the fruit’s all still there too. Really quite lovely, and if I were reviewing it tonight I might be tempted to nudge the score up a little.